Dodgers right fielder Yasiel Puig didn’t shy away from showing some affection toward former teammate Charlie Culberson during Game 2 of the National League Division Series against the Braves on Friday. 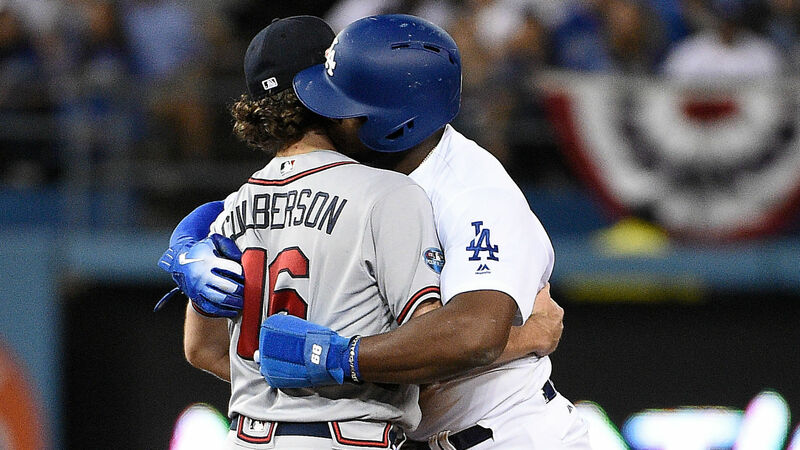 Puig turned a failed attempt at stealing a base in the bottom of the sixth inning into an interesting moment as he appeared to embrace Culberson with a hug and a kiss, which landed on the neck of his former teammate. Culberson, who had just tagged out Puig at second, laughed it off and gave him a big pat on his back before Puig ran off the field. Puig and Culberson played together with the Dodgers for two seasons, which saw them come just short of a World Series championship in 2017 against the Astros, before Culberson was dealt to the Braves during the offseason. The Dodgers went on to win the game 3-0 and now lead the series 2-0. Game 3 of the best-of-five series is Sunday in Atlanta. Aaron Chalmers MMA fight: What time is Geordie Shore star’s BAMMA 33 fight against Karl Donaldson and what TV channel is it on?